Life in a city as expensive as New York is not easy in the era of rising costs. We are accustomed to thinking that quality services inevitably have to cost plenty of money, but do they? As an NYC resident, you are probably wondering whether it is possible to find cheap local movers NYC without getting scammed. There is a way to identify fraudulent moving companies, but it’s utterly wrong to assume that all cheap movers NYC are suspicious and scammers. 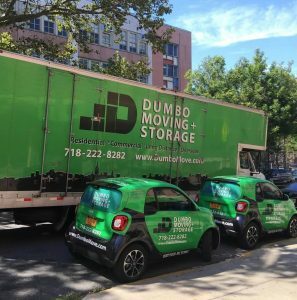 Since 2007, Dumbo Moving and Storage NYC and our team of qualified professionals have been standing as a prime example that affordable prices and reliable services can go hand in hand. We can all agree there is hardly a better duo. We could rest easy only after coming up with the best price range for the services we provide. Everyone has a powerful motivator, a driving force that guides us in everything we do. For Dumbo Moving and Storage NYC, that force is you. Our customers are our treasure, and you should treat treasure with attention and care. Since we listen to your needs, we have worked very hard on affordability, which we are aware of is a vital aspect for an average person. 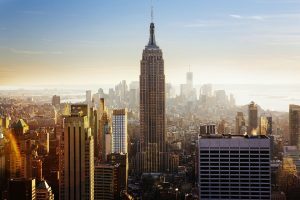 Be it local or long distance NYC relocation; moving is expensive as it is, without adding steep prices to the equation. Our team sat down and diligently brainstormed until we arrived at the optimal prices that would best suit both parties. Our team believes we found the perfect balance between appreciating the effort our team of movers puts in and your satisfaction with the prices we offer you. Affordable prices are just the beginning of the offer you get if you choose us for your relocation professionals. Our cheap local movers NYC will deliver more than what you expect, and that is a smooth, seamless, and stress-free relocation. What does the offer of our cheap local movers NYC include? We have made it our mission to prove to you that the adjective cheap can indeed go well when paired with reliability and efficiency. Where better to start than by briefly familiarizing you with a part of our offer? Should you need our cheap local movers NYC to relocate your office or your home, all you have to do is call. If the price is an essential part of your relocation, then the moving services you opt for are the second most crucial aspect. With the right moving services, every relocation becomes a piece of cake. That’s something we are fully aware of, which is why we made sure to create several moving services that can assist you in dealing with different parts of your relocation. From the so-called necessary moving services to specialty moving, Dumbo Moving and Storage NYC can offer it all! And that is just a part of it! To find out the full extent of our offer of relocation assistance options, your best course of action would be to call our offices. Once a representative answers, feel free to pose any question you may have. We strive to provide you with assistance, and that begins from the moment you dial our number. Our high-quality and needless to say cheap moving services at your disposal! Of course, you will not be able to alter the actual cost of our moving services. But, you will be able to create the relocation package of your choice. You can opt for as many or as few moving services as you need to satisfy the needs of your relocation. We are not one of the cheap moving companies NYC that will put restraints on you. By choosing only what’s needed, you will be able to fit our movers into your moving budget. All the while, you will receive a highly efficient and trained team, be that team composed of movers and packers, or just movers. When it comes to our lovely New York, there is not an area we won’t reach in the attempt to cater to your needs. Our team of cheap Brooklyn movers is just as affordable as Manhattan ones, and that applies to every location we serve. We value our customers equally, no matter where they come from or where they are going. Our cheap local movers NYC can quickly relocate you around everyone’s favorite city. Who is to say that you have to settle for average when you can have the best? What a big portion of NYC’s residents already know is that, if you want the best, all you have to do is get in touch with us at Dumbo Moving and Storage NYC. Our moving professionals were carefully selected. Not only do they have a decade worth of experience, but they also come with plenty of training. Keeping your safety and the safety of your items is their primary goal. It only goes to show that you don’t have to spend bundles of cash if you want to have something done right. All you have to do is contact the right people for the job! Our cheap movers NYC offer utter devotion at the best rates in the five boroughs. Are you a new customer or have you used our NYC moving company before? Well if you did, you get an automatic Repeat Customer discount. If you were referred to our company, you will also get a discount. (Please note that you can only use one type of discount or promotion code when booking a move). For additional offers, check our social media profiles. We often post discounts on our Facebook and Twitter accounts. Not a fan of social media? Try looking for deals on Yelp and Groupon. We have deals with both sites, so find a deal on whichever site you prefer. But don’t let the best cheap movers NYC slip out of your hands! Where else can you make money while moving? Only with Dumbo Moving and Storage NYC! Hire the most recommended and well-known moving specialists in the Big Apple. Top quality for the best rates! Have you been left satisfied with the services our cheap NYC movers provided and want to make money with us? 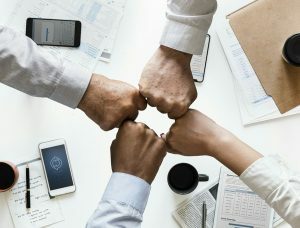 We offer referral commissions to people who can refer us to someone who then moves with our company. As long as the person never used our company before, you are entitled to a commission. If the referred person or persons are New York movers, then you will receive a 7% commission. If they have a long distance move (out of New York) with us, it will be a 5% commission. To find out more about our referral program or if you want to refer someone to us, please email us, and we will get back to you! Not only are we cheap movers NYC offers, but we also have special programs for your convenience. 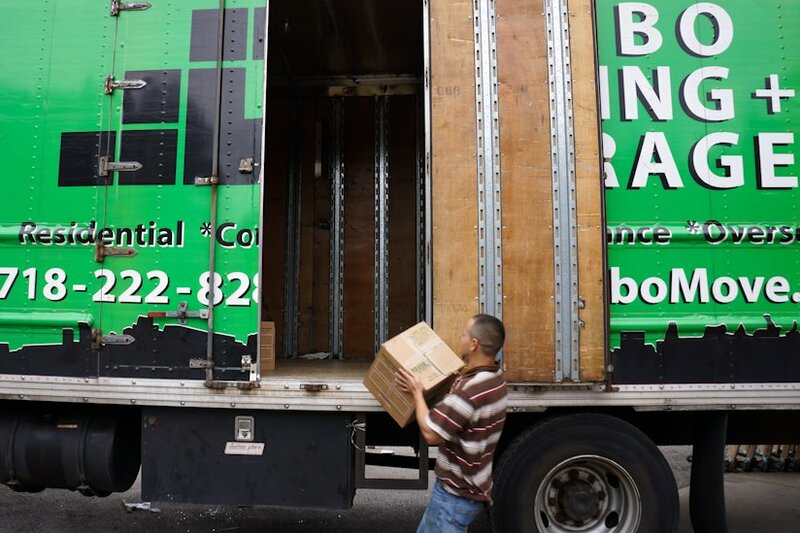 NYC offers a very competitive market in terms of moving services. Rest assured that among so many affordable moving companies, you will be able to find at least one that suits your needs. If you are moving on a tight budget, the very first step would be to determine which type of moving services you need. Once you establish what you have to move, the moving distance and timing, you can contact cheap moving companies NYC based and ask for a quote. Finding New York City movers that offer the best service for the money you are willing to spend is not an easy task. A recommendation from the person who has moved house recently can mean a lot. Otherwise, reading online reviews will help you distinguish quality moving companies from fraudulent ones. Gather all valuable information regarding the movers you might be interested in and investigate them further. Moving can severely burden your budget if not planned properly and well in advance. Your choice will affect the outcome of the move, so make sure you hire reliable and reputable movers without spending too much money. NYC is an expensive place to live and New York movers are usually expensive too. Everyone wants cheap movers NYC, but no one wants their stuff broken. So here at Dumbo Moving and Storage NYC, we like to make sure to provide the most affordable moving experience we can, while still offering a high-quality moving experience. In this section, we will provide tips to help you cut cost on your move. It only goes to show that our care for you is never-ending! Dumbo Moving and Storage proves that there is such a thing as top-rated and reputable cheap moving companies NYC. – Compare moving quotes from different moving companies in NYC. Start early and take your time to explore the moving market in New York City. Are the movers of your interest that affordable? Ridiculously low moving estimates usually are indicators that you are dealing with rogue movers. Finding the perfect combination of price and quality is essential for the success of your undertaking. A rule of thumb – don’t go for the lowest price, even when in desperate need of the cheapest movers NYC recommends. – Know precisely which moving services are included in the quote and if there are hidden moving costs that will eventually surprise you. Dealing with unexpected fees and taxes is something you want to avoid during the moving process. Some of the most common services that cause additional charges are appliance servicing, carrying heavy and bulky items, taking the items up and down the stairs, elevator service (if the process is delayed because other people are using the elevator), long carry, temporary lodging, etc. – Moving on a budget means that you will have to deal with some moving tasks by yourself. However, if you decide to rent just a moving truck, you will have to handle all the moving tasks by yourself. First of all, get rid of all unnecessary items. The fewer items you move, the less you will pay for packing and moving services. Don’t get too attached to unnecessary household items. Instead, get rid of them by organizing a garage sale or by giving them to charities. You are the one that decides how cheap or expensive your movers will be! Since you are looking for affordable local movers NYC, be reasonable with your requests. – Gather friends and other volunteers that are willing to assist you with packing and loading during the moving day. – Finding cheap or free moving boxes NYC is a necessary process if you are moving on a tight budget. You can get them at restaurants, bookstores, liquor stores, etc. – You are likely to get a discount if you are moving during the offseason – early spring, late autumn or winter. Cheap moving companies NYC usually have some special offers during that period. People moving to NYC often expect expensive moving services, and they are pleasantly surprised when they come across some affordable and professional movers. 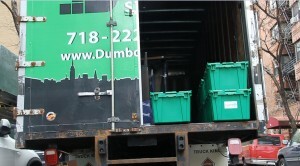 With Dumbo Moving and Storage NYC high-quality and affordable moving experience is a guarantee. It’s easy to find cheap movers NYC; you need to know where to look. Maybe the perfect reputable moving company in NYC is just around the corner in a quiet Brooklyn or Manhattan neighborhood. – Getting an on-site moving estimate will help you get a clear picture of how much the move will cost you. Moving companies that insist on giving the quote via phone are usually not reliable and professional. You should avoid extremely low moving estimates, too. There are ways to identify fraudulent moving companies, make sure you are familiar with all of them. Differentiating between fraudulent and cheap local movers NYC is of utmost importance for the success of your relocation. – How does the moving company charge? Whether they charge by cubic feet or weight will determine the final cost of the moving services. Movers that charge by cubic feet will calculate the price based on the volume of the shipment. Estimates based on weight usually are not that accurate. – Long-distance relocation can get a bit more expensive if you are moving your pets overseas and if you have a lot of goods that need to be shipped. – When researching moving companies in the Big Apple make sure they are registered with the US Department of Transportation. They should have proper licenses and insurance. Bear in mind that finding cheap moving companies in NYC is not just about the price, but also about quality. Make sure that you trust enough the people you are going to hire. – Oversized and bulky items need special handling. Your movers will probably charge you additionally for moving some delicate items like pianos, pool tables, safes, flat screen tv, hot tub, etc. Since moving these items takes a lot of energy, time and money, you should think twice before deciding whether they are worth the effort. Sometimes purchasing a new item is more affordable than moving the old one long distance. – Storage services will cost you additionally, and the charge will be based on the type of storage you need. Renting a storage unit is a perfect solution if you need more room in your living or working space. The total cost of the storage service depends on the size and special features of the facility. Those features include 24/7 availability, video surveillance, temperature control, quality security system, etc. There is no time to be wasted when the best cheap movers NYC are waiting for you! Wouldn’t you feel better and more relaxed leaving the worries related to your relocation in someone else’s hands? 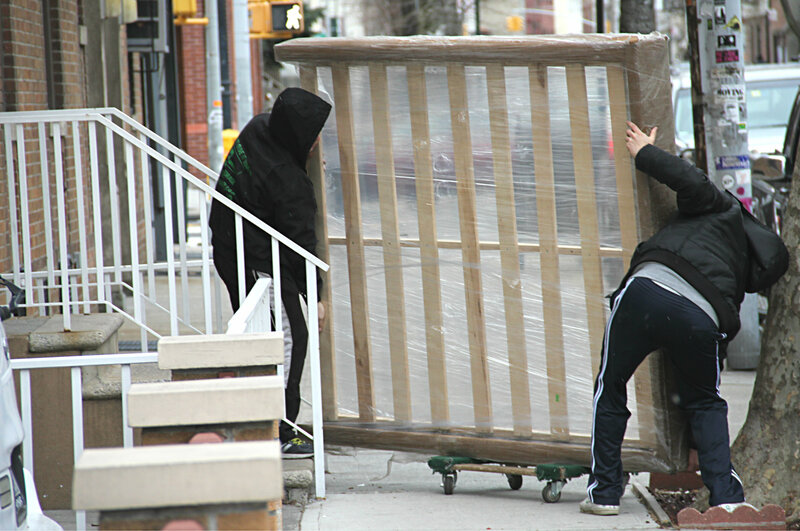 You can rest assured there are no hands safer than the ones our cheap local movers NYC offer! It’s high time you stopped guessing just how affordable we are. Instead, take our moving quote calculator, input the necessary information and be provided with an instant and free cost estimate. With Dumbo Moving and Storage NYC, there is no waiting of any kind. We immediately take care of your needs, and we love every part of it.